The winners of the 2013 "Earth and Sky" photo contest show off the beauties of the night sky and demonstrate the effects of light pollution. Are the images featured in The World at Night's annual "Earth and Sky" photography contest meant to celebrate the wonders of the night sky, or draw attention to the worries about the night sky? They're meant to do both, says astrophotographer Babak Tafreshi. 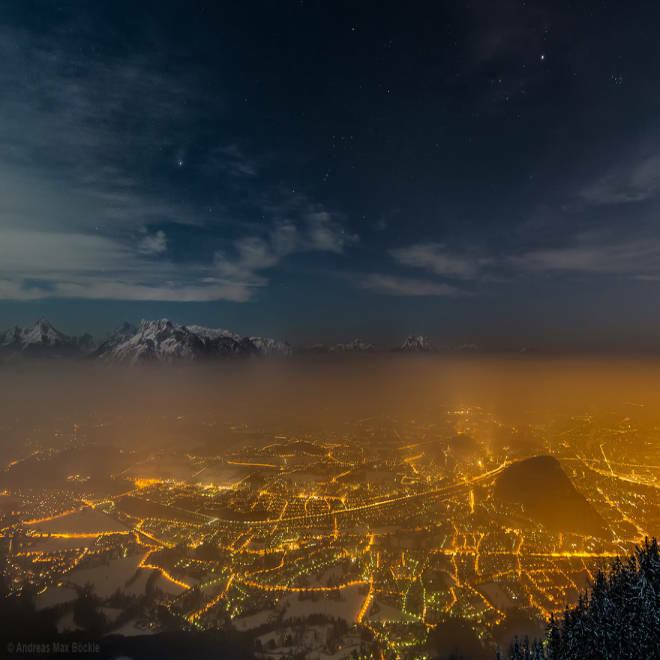 For example, consider "Stars Over Salzburg," one of this year's top-rated images. Your first impulse is to marvel at the golden glow of the Austrian city, as seen from an Alpine vantage point high above. "But then you realize the photographer has moved away from the city to the mountaintops in order to separate himself from the light pollution," Tafreshi, founder of The World at Night, told NBC News in an email. "Inside the yellow light cast by the city, people are no longer able to see this beauty." That's the tragedy of the modern world, right? Studies suggest that as much as 80 percent of the world's population can no longer see the Milky Way, due to the lights that illuminate our cities and roadways. But it doesn't have to be that way, and the picture of Salzburg proves it. Tafreshi pointed out that the direct, unshielded glow of city lights can be seen even from a mountaintop. "That shows that the lights are shining upward," he said. "Light pollution is not the lights we need for our modern world. It's the unnecessary, wrong-directed and excessive light that scatters to the sky instead of illuminating the ground. It isn't just an astronomer's problem. It's a major waste of energy, it disrupts ecosystems and has adverse health effects." The International Dark-Sky Association estimates that $1 billion is spent in the United States every year to generate artificial light that goes to waste. And as other countries become more urbanized, the stars disappear from wider swaths of the world. "Our images try to show how the night sky is an essential part of our environment, and not just an astronomer's laboratory," Tafreshi said. "They display how the night sky is becoming a forgotten part of nature for many people in urban, light-polluted areas. A major goal for us in TWAN imaging is to reclaim the beauties of the night sky and make people aware of this." The World at Night isn't just about the dark side of the disappearing sky. The winning photos include views that reveal cosmic glories in all their purity. "A good example in this year's contest is 'Crossed Destiny' by Luc Perrot, from Reunion Island near Madagascar," Tafreshi said. "The stunning view of the Milky Way above the Indian Ocean has no touch of our modern world. The galactic band is merged with the horizon of our planet." Click through our slideshow of images from this year's "Earth and Sky" contest, and check out The World at Night's website for still more cosmic glories and cautionary tales. Earth and Sky Photo Contest 2013 from Babak Tafreshi on Vimeo Watch it in full-screen HD.